Christmas is a wonderful time to connect with family and friends, but the holiday season is also laced with excessive consumerism and waste. 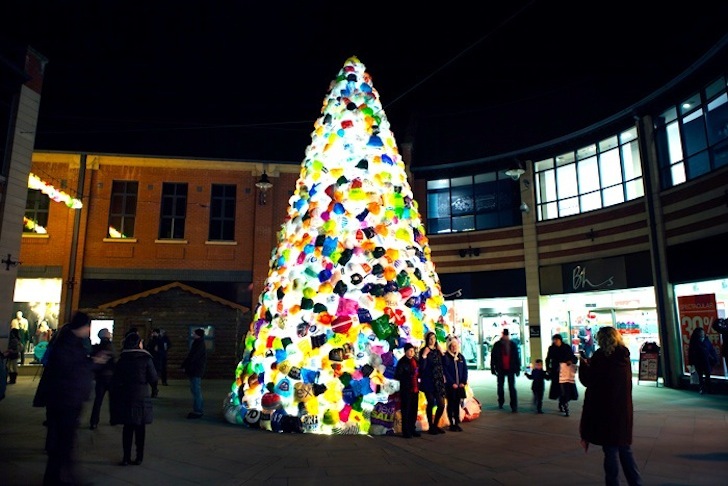 Spanish art collective Luzinterruptus brings attention to our shopping addiction with the Consumerist Christmas Tree, an art installation built from thousands of multi-colored plastic bags. The massive illuminated Christmas tree created as part of the Lumiere Festival of Light has since been turned into the centerpiece of the UK’s Prince Bishops Shopping Center. In just one week, volunteers in multiple workshops helped plasticize and transform the prefab conical structure into the giant, light up Consumerist Christmas Tree. Extra plastic bags were used to cover Christmas light garlands that were strung up between buildings to illuminate pathways. Since the construction phase of the Christmas tree coincided with Madrid’s garbage service strike, the artists have also used the tree as a symbol of solidarity with the workers. A monument to our throwaway society, the 30 foot tall recycled tree symbolizes the wastefulness of excessive shopping and its subsequent environmental consequences. 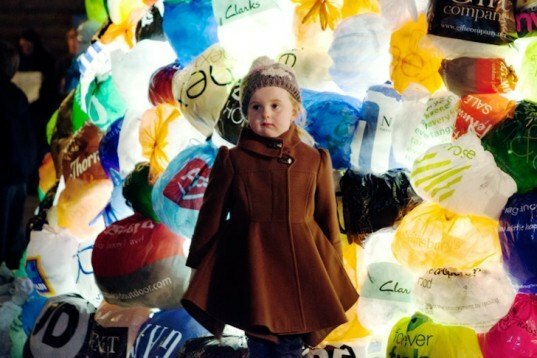 To create a full, bulbous shape, each bag was stuffed with clear plastic donated by surrounding shops. The massive illuminated Christmas tree was created as part of the Lumiere Festival of Light and has since been turned into the centerpiece of the UK’s Prince Bishops Shopping Center. In just one week, volunteers in multiple workshops helped plasticize and transform the prefab conical structure into the giant, light up Consumerist Christmas Tree. Since the construction phase of the Christmas tree coincided with Madrid's garbage service strike, the artists have also used the tree as a symbol of solidarity with the workers. Extra plastic bags were used to cover Christmas light garlands that were strung up between buildings to illuminate pathways. Luzinterruptus sourced over 4,000 plastic bags from local residents, who were given cloth bags in exchange. The Consumerist Christmas Tree was inspired by Luzinterruptus' previous work, Plastic Garbage Guarding the Museum.